How do I begin to express my excitement for this sidequel, as Mather terms them. I’m not a science-fiction fanatic, but I do enjoy them. If I had to compare, this book would be a cross between Bladerunner and that movie called ‘Surrogate’ (the one with Bruce Willis). And they were good movies. 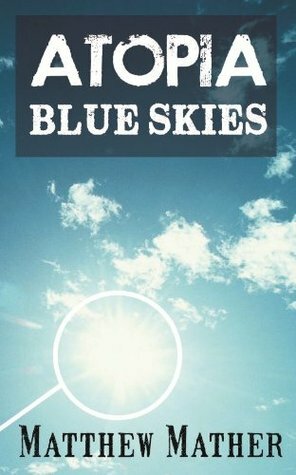 Blue Skies is one of six sidequels, all which begin at the same point in time and can be read in any order, and follows a girl called Olympia Onassis. She is a pretty successful advertising executive, but everything in the world seems to annoy her. She even has mixed feelings for her cat. She loves her space, and when people get too close, she pushes them away. She can’t accept the fact that some people express genuine emotions and always finds a fault within everything. So basically, Olympia blacks out at a business pitch and she gets taken to the doctor who installs a ‘pssi’ in her to test after getting her consent. The pssi is some really fancy new technology that allows the user to basically control many aspects of their everyday life. You can block out annoying advertisements and even people! The world building by Mather is crazy. He’s taken modern New York City and added some Bladerunner elements to it. Atopia is not actually a dystopia, but from Olympia’s point-of-view, you’d think it was. The floating city was actually created for the richest and wealthiest minds from the world. The city is located in the Pacific near California (just to give you a geographic perspective) and it floats. It floats. Blue Skies doesn’t really go into detail about the whole intricate working of Atopia, but you kind of get the gist of it. It’s very hard to explain, so please just go read it. You won’t regret it! Olympia isn’t a very likeable MC, but with the direction the plot was heading, she couldn’t exactly have been one. I know others that have read Blue Skies would actually go as far as to say they hate her, but I don’t. Although Olympia was unlikeable, I knew Mather intended her to be so, so I was able to look past it. Some of the things that annoyed her personified her so well, it was like I actually knew her. She was so well drawn out, I actually wanted to root for her near the end. You learn from your experiences, and by the end of the sidequel, I knew Olympia had grown as a character. And this was in only 42 pages. Kudos Matthew Mather, YOU, are awesome. So yes, this sidequel is HIGHLY recommended. It’s only $0.99 on amazon … so seriously, why not? What do you have to lose?